How to grill lamb chops perfectly every time! Lamb Chops are quickly seared and tender when you follow a few easy steps. This is a quick meal that can be fancy, but fast and easy enough for a simple weeknight meal too! 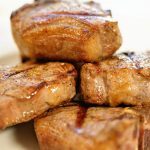 This recipe gives you step-by-step directions so you can grill lamb chops perfectly every time! Remove the lamb chops from the refrigerator. Season the chops - brush them with olive oil and sprinkle with chefs blend spice mix, salt and pepper to taste. Allow to come to room temperatures for 20-30 minutes before grilling. When you are ready to grill - preheat the grill. Get it screaming hot! Brush the grill lightly with olive oil. Sear the chops for 2-3 minutes on side one. Flip and do the same for side two. Remove from the grill immediately, place on a platter and cover with foil. Allow to rest for 10 minutes prior to serving.